Campaigners have condemned a council in Ireland for offering free car parking “to mark European Mobility Week ”a week which is associated with ‘car-free day’ and promoting a reduction of car use. European car-free day is on Friday, but Galway County Council is promising free car parking on that day. 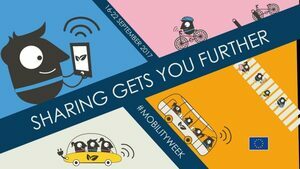 Posted in Misc and tagged European Mobility Week, Galway County Council at 3:19 pm on September 21, 2017 by Broadsheet. If anything they should double the price of parking, or introduce a congestion charge that day (proceeds to charity or sustainable transport initiatives) rather than giving everyone an incentive to use their car! I sort of hope its a cynical ploy rather than boneheaded stupidity! If it was free car parking at the train station, I’d applaud it.